No police will be stationed inside Egypt's university campuses, said Prime Minister Ibrahim Mahlab on Friday, signaling a possible ease in curbs on student demonstrations ahead of the new academic year. "There will be no university guards inside universities, but there will be administrative security," said the premiere in a phone call with private satellite channel CBC on a show hosted by Diaa Rashwan, head of Egypt's Journalists Syndicate. 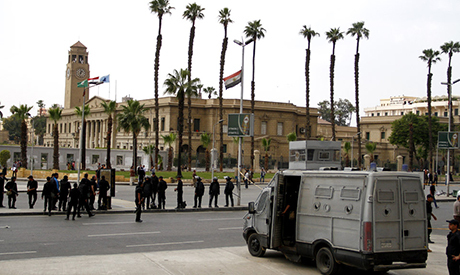 Administrative security are guards hired by Egyptian universities and are not affiliated with the interior ministry. "[The ban on university guards] is the only thing that can be done. No units from the interior ministry can be present on a permanent basis inside universities," Hany El-Hosseiny, professor at the Faculty of Science at Cairo University and a member of the March 9 Movement for the Independence of Universities, told Ahram Online. A decision by the Court of Injunction in May 2014 confirmed a ruling to have security forces back on university campuses – in contradiction to a ruling by the State Council in 2010 to ban the interior ministry's security guards from entering campuses. The State Council is the institution responsible for issuing decisions regarding security on campuses and not the Court of Injunction, said Amr Shalakany, an associate law professor at the American University in Cairo. "The Court of Injunction is issuing the decision of university guards as part of a large phenomenon in which [it's] towing the government's line," said Shalakany, adding that the decision by the Court of Injunction represents a political will inside universities to cooperate with the return of the police. Despite the controversy, police repeatedly entered university campuses to disperse protests that occurred almost daily during the last academic year. Students were at the forefront of demonstrations in favour of ousted president Mohamed Morsi, especially as his supporters were subjected to a prolonged government crackdown that limited their street presence. The protests often ended in violent clashes with security forces and hundreds of students were arrested and several killed. Mahlab also said that some universities officially requested that university guards enter campuses – but the government refused. The interior ministry decided to enter universities as a part of "anti-terrorism" measures carried out after Morsi's ouster. However, El-Hosseiny says administrative security can be secretly affiliated to the police, explaining that universities hire retired police officers to govern the administrative guards. According to a cabinet meeting report issued on 3 September, the minister of higher education said there will be coordination with the interior ministry regarding the safety of students and university buildings. He also said he got offers from students to help administrative security in securing the gates and fences in order to prevent violence. This year's first academic semester at universities officially starts 11 October.